Frankly, the 2012 Spanish Grand Prix Qualifying was a boring one! In the lead up to the session, most people following the sport knew that tyre strategy would be crucial after Pirelli brought their soft and hard compound tyres to a race for the first time this season. As mentioned in my previous post, tyre strategy isn’t restricted to Race Day alone; teams and drivers are bringing forward their strategy to the Qualifying session as well. This is leading to them to restrict their qualifying attempts to save tyres which of course is affecting the overall ‘show’ of the sport as we witnessed minutes of no action during today’s qualifying session. However, I do expect that ‘qualifying only’ tyres will be introduced in Formula1 sooner or later! – Great lap by Hamilton to beat the rest of the field by a clear half second and clinch provisional pole. This would have been Hamilton’s third pole of the season and Mclaren’s 150th pole over-all. However, a refueling error meant that Hamilton was penalized by the Stewards post-race. The penalty means that Hamilton will start the race from P24 and last! – Hamilton was asked by the team to stop the car on-track to save enough fuel for the FIA to a sample for inspection post the session. However, this was deemed as breach of rules by the Stewards and hence the penalty. 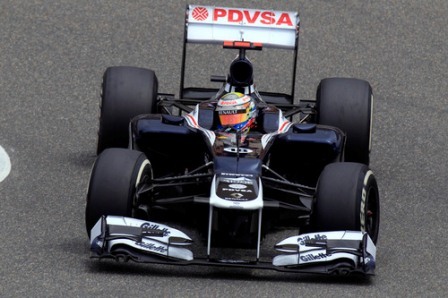 – The penalty also meant that Pastor Maldonado got promoted from P2 to pole position, his first for Williams. The last Williams pole was at the 2010 Brazilian Grand Prix with Nico Hulkenberg. – Both Hamilton and Maldonado were the stars of the qualifying session which otherwise saw Schumacher and Vettel post no time to save tyres for the race. – Kobayashi drove a brilliant lap to get into Q3, however, a technical issue towards the end of Q2 meant that he couldn’t participate further. He starts from P10 tomorrow. – Alonso, who initially qualified in P3, will now start tomorrow’s race from P2, much to the delight of the local Spanish fans. This also means that Alonso and Ferrari could be capable of fighting for victory tomorrow. – Yet another exciting and entertaining session which saw big names like Massa, Button and Webber eliminated. Button qualified in P11 followed by Webber in P12. Both drivers missed entry into Q3 by less than a tenth of a second! – Massa on the other hand had yet another disastrous qualifying session. He failed to get into Q3 for the fifth time this season and qualified in only P17! How much more time till Ferrari decides to replace him? – From the mid-field runners, Perez, Kobayashi and Maldonado managed to get into Q3 where P4 to P10 was separated by less than a tenth! – While the drivers outside top ten might have an extra set of tyres at their disposal in the race, they will also need to cover that much extra ground to be able to move up further. However, with such a close and competitive field, their task is only going to be that much more difficult. – While the usual suspects were out in this session, there were a few surprises! – Senna in his Williams was the fall guy of Q1. Frankly, I am not too surprised by his elimination and he didn’t do himself any favours by spinning out while attempting to go faster! I expected him to be able to handle the pressure and I am sure the team expected him to match Maldonado’s pace! Senna’s lap was a staggering one and half second slower. – In the Caterham camp, Petrov out-qualified Kovalainen for the first time this season by 3 tenths. However, I don’t see them making much progress during the race. – Pic out-qualified Glock in the Marussia camp by half a second and I don’t expect them to perform miracles in the race either. – As for HRT, de la Rosa was a further half a second down on Glock in P23, but it was Karthikeyan who bore the brunt of the team’s bad luck. Car issues meant that Karthikeyan could only manage a laptime nearly four seconds slower than his team-mate. The FIA gifted Frank Williams a pole position on his 70th birthday by penalizing Hamilton, but I do not expect the Williams to win the race. Maldonado will be in the reckoning for a strong points finish, no doubt. Going back to Hamilton’s penalty, while Twitterverse sees the penalty as too harsh, there are few options that the FIA could have considered rather than exclusion. Possibly a 5 or 10 place grid penalty? Choose his last registered time on the hard compounds or from his Q2 attempt? Frankly, I think a grid penalty is too lenient and the others are too complex to dish out! It is critical for the FIA that this rule is enforced else we could have a scenario where ten cars will stop on track after crossing the finishing line in Q3! It will also be interesting to see Hamilton charge back to the top. While he is perfectly capable to do so, that he has used up most of his fresh tyres will be a big hurdle for him. I do think that he will finish in the points, but I am also sure that he will join Schumacher’s criticism of the Pirelli tyres which will make his comeback tougher than usual! Red Bull Racing, who failed to show pace in Q3, will be the happiest team on the grid after their competition has successfully and consistently failed to launch a complete bid to beat them on track. And of course, this is more to do with Mclaren’s recent pit errors which are ruining their driver’s chances in the race and the championship! My predictions for victory tomorrow? Watch out for the two Lotus cars and of course the Spaniard, Alonso! The temperatures are expected to be cooler, in which case, will the Mercedes’ charge their way through?